If you're looking for a balance bike for a teen or an adult, there are two main options. 2.) Take off the pedals on a normal bike. There are advantages and disadvantages to both options which are explored below. The Strider 20 inch balance bike has been designed for teenager and adult use. The most important feature when getting a balance bike for a person of any age is that their feet can rest flat on the floor when sitting on the bike. They can then use their feet to push along the ground to propel along. This bike has a height adjustable seat so it can be adjusted so that the teen or adult in question can sit on the seat with their feet flat on the floor to do just that. It will fit a rider who has an inseam of 26.5 - 32.25" / 67.3 - 81.9cm. 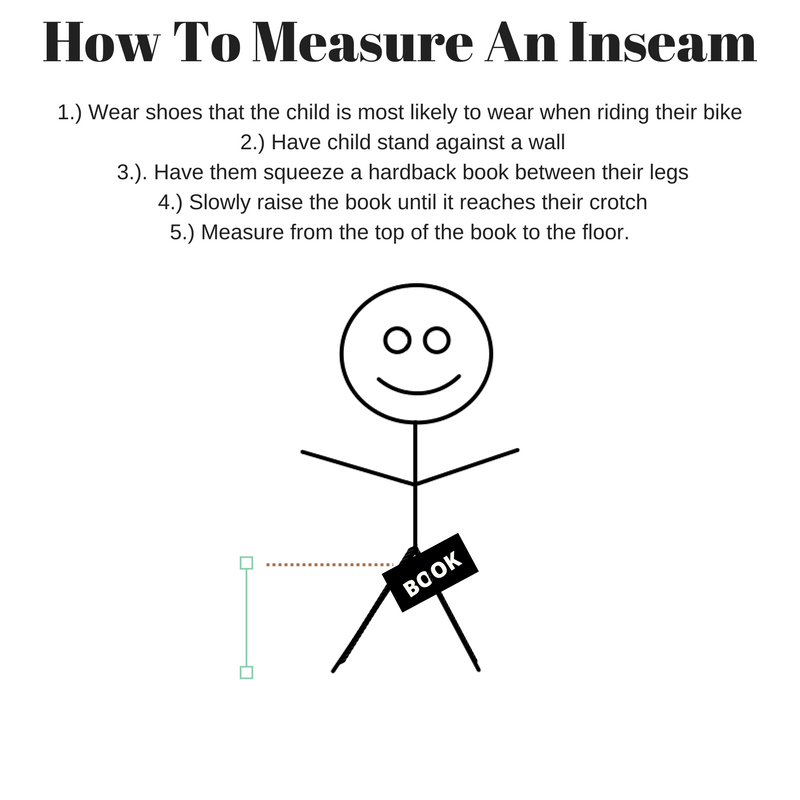 Find out how to measure an inseam below. It has a simple lightweight design and weighs (9.6kg/21.2lbs). A lightweight balance bike is easier to control and manoeuvre. It's also easy to pick up and put into storage in a shed or garage. The pneumatic tyres allow a smooth ride over different terrain. The fully padded seat is mounted on a rail allowing multiple front to back and seat angle adjustments. The unique foot rests can be added and removed according to the riders size and ability. The footrests are fantastic for resting the rider's feet when gliding along. A cheaper option to buying a Strider balance bike is to remove the pedals from a normal bike. This can be easily done and there are many videos on youtube showing you how to do this. The main thing to remember after the pedals have been removed is to set the seat height so that the rider's feet can be flat along the floor. They can then push their feet along the ground so that it propels the rider along. The downside about taking the pedals of a standard bike is that a normal bike tends to be heavier than a specially designed balance bike. This can make it more difficult to ride as a balance bike. If you are just using a balance bike to get some help learning to balance before progressing onto a pedal bike, this may be a good option as it is can be much more inexpensive than an adult balance bike. Once the balancing side of riding a bike has been mastered, the pedals can then go back on the bike and you have a bike ready to pedal again. However if your are planning on using the balance bike as a permanent option of a bike, it's definitely worth investing in a Strider. The footrests on the Strider mean that it can be fun to glide along once with your feet resting once you have built up some speed. Taking the pedals of a standard bike would mean the rider doesn't have this feature. 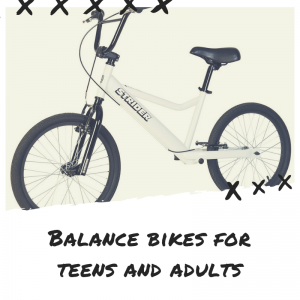 Why Have A Balance Bike for a Teen or Adult? They are a lot of fun for gliding along on a cycle ride. They are great for adults who have dyspraxia, co-ordination difficulties, brain injury or other challenges or disabilities which may mean learning to pedal a bike is extremely challenging. Adults or teens with limited mobility may find that whereas walking, running or riding a normal bike may tire them out too much or put too much strain on them physically, a balance bike will allow them to travel further with a lot less effort. So they could move much further and more quickly on a balance bike with less effort than if they were walking. There are many advantages of learning to ride a balance bike. They are great for building core strength as the actions involved when riding a balance bike build strength in this area. Your core is used whn sitting up straight when riding, balancing when gliding and leaning when turning. Using your feet and legs to power along means it's great for building up muscle in that area. A balance bike is lighter than a pedal bike. This means it's easy to lift and move out of storage. It is also easier to pick up off the floor. Therefore it can be a good option for those that have a bad back or who aren't able to lift heavy objects.